St. Timothy Lutheran Church is part of the ELCA. St. Timothy Lutheran is licensed by the federal government as a not-for-profit. 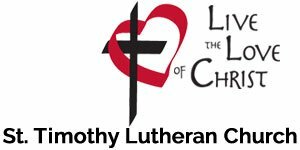 St. Timothy Lutheran Church (STLC) operates the St. Timothy website, which provides business information for STLC. The website also provides the ability for users to sign up for an email subscription SERVICE. If you have subscribed to the STLC email list SERVICE we collect the following data. If you sign up for our email list and STLC determines your subscription request is related to spam, malware, or other harmful intent to the STLC site, STLC reserves the right to decline or unsubscribe your subscription. STLC email list is intended for subscribers who are friends of STLC or members of STLC who want to receive emails and notifications of STLC related news. If you are a subscriber to our email list service then your subscription data (first name, last name and email) is used by our email marketing plugin called MailPoet to analyze our email/marketing campaign success rates and in order to enable subscribers to manage their own subscription data. For further explanation on how your subscriber data is used by Mailpoet, please see their privacy statement. STLC relies on third party services to maintain its web site. STLC never shares or resells any of its data. Print St. Timothy Lutheran Church of Naperville, IL Privacy Statement.